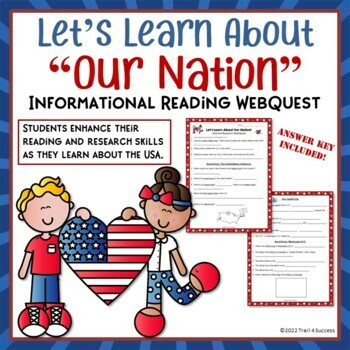 This two page Our Nation webquest allows students to use their internet search and informational reading skills to learn more about the USA, Washington D.C. and its make-up. There are 20 questions in all about the United States. Students use Kidzsearch.com (or Google) to find information about the United States and its government. Student friendly graphics have been added to make it more appealing to your students. Students love doing these informational research activities - especially if they get to choose which ones they want to do! Webquests are a very useful activity for fast finishers because students eventually are able to work quite independently at their own pace. "Thanks! The kids enjoyed using your skill sheet and found the search easy and quick to complete." "Super accurate! Loved that the website was up-to-date with the task!" "The students had fun with this one." "Very easy to use and follow! Thanks!" 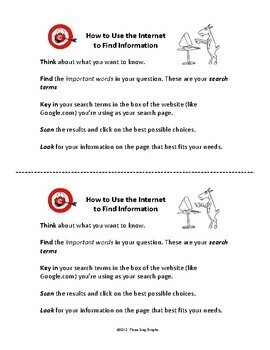 Check out my How To Search the Internet lesson to help students research online more efficiently. Some graphics used in this unit are from Scrappindoodles.com. All new products are on sale for one day after they are listed! Follow my Trail 4 Success store so you don't miss out.